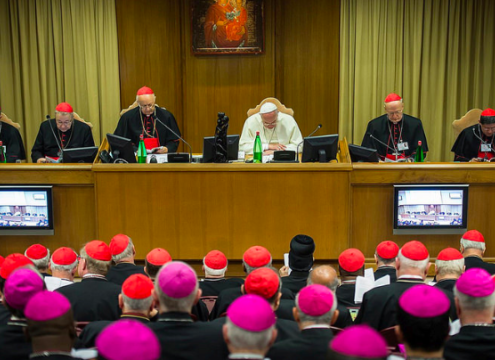 The Synod on the Family (EXTRAORDINARY ASSEMBLY OF THE SYNOD OF BISHOPS 5-19 OCTOBER 2014) is in full swing in Rome. The official photos of the opening tell the story better than any comment an informed theologian might offer. The plethora of men in vestments, the dearth of women in any form (except the painting of the Blessed Virgin Mary), and the conspicuous absence of children (save little Jesus in his mother’s arms) speak volumes about the meeting. How could such an assembly presume to discuss family life with any authenticity or integrity? Luckily, representatives of progressive Catholic groups from around the world are also in Rome. They are sharing experiences of families of many sorts, telling stories of their efforts to love faithfully, and insisting on substantive changes in Catholic teachings on sexuality, marriage, and family. The smart money is on them, not the clerics and their handpicked guests (who have limited voice and no vote), to reshape the moral landscape.